Game 5 of the Kisei title started today: Cho (Black) played the last move of day one (49, in the upper-right corner) before Yamashita sealed his next move. 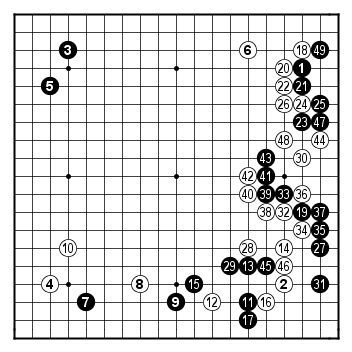 While Cho cannot afford to lose any other game, Yamashita has a comfortable 3-1 lead so he only needs to win one of the next 3 games (including this one) in order to win this match and keep the title. Black seems to have more territory, but he also has several groups on the right hand side to worry about. The game will continue tomorrow. Ya he puesto un link. También al sitio de Alexandre Dinerchtein. ← AGUSTÍN SÁNCHEZ VIDAL, PREMIO PRIMAVERA DE NOVELA XII EDICIÓN POR SU OBRA "NUDO DE SANGRE". ¡ENHORABUENA!